Composting is the way nature recycles organic materials and returns nutrients to the soil. 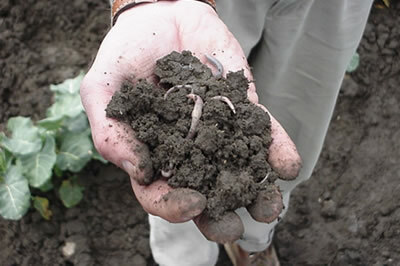 Over time, organic matter such as manure, leaves, grass clippings, twigs, and fruit and vegetable food waste biologically decompose into a dark crumbly soil conditioner called compost. We can accelerate this process by creating and maintaining a home compost pile. Organic materials such as yard and food waste account for 33% of the waste generated in a typical Monterey County household. Composting these materials reduces waste (preserving limited landfill space). Whether you have trees and shrubs, a garden or a few container plants, anything you grow will benefit from compost. Compost bins or enclosures are a good way to contain your organic materials during the composting process, although you can also pile your material up in a “heap” if you have the space. The ideal compost enclosure or space will accommodate one cubic yard of volume. Enclosures can be as simple as a wire mesh hoop or more elaborately constructed with wooden slats or re-used pallets. Several commercially made bins may also be purchased and are available in a range of styles and sizes, including low cost compost bins at the Last Chance Mercantile at the Monterey Regional Waste Management District. Plans to build your own bin are available online at www.mrwmd.org.